The funeral vocation of the area is born during the French Revolution, when this former plaster pit has been used for the burial of the executed royal guards. Finally, the place is officially opened as the “North Cemetery” in 1825. Though smaller, the cemetery evokes the Pere-Lachaise, for numerous reasons. 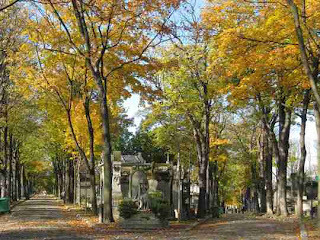 - The cemetery appears like a nature reserve with its 750 trees at the heart of a hectic district. Thus for the recumbent statue of Cavaignac, by Rude, or the surprising monument of Osiris (with a copy of Michelange’s Moses) which could evoke the artistic richness of the place whereas the graves of the Montmartre artists (such as Zola, Degas, Berlioz) highlight its historic importance. As rich and poetical as the Père-Lachaise, the Cemetery of Montmartre, less crowded, is calmer and suitable for understanding the history of a neighbourhood and a city.